Pakistan's relations with Saudi Arabia predate its birth in 1947, when the country was carved out as an independent state from British colonial India. And many Pakistanis - like Muslims in all countries - feel tied to Saudi Arabia because of the traditional Islamic pilgrimage to the holy city of Mecca. 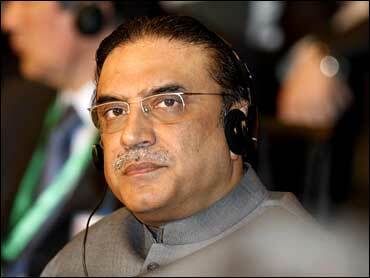 But the frictions between King Abdullah and president Zardari appear to be driven by political trends. Though Saudi Arabia itself is battling an al Qaeda-backed terrorist challenge the Saudi authorities have for years been uncomfortable with Pakistan's practice of handing over militants arrested on its soil to the U.S., a senior western diplomat told CBS News. "For the Saudis, these people must be brought to justice on their home turf rather than Guantanamo Bay" said the diplomat, who spoke to CBS News on the condition of anonymity. An Arab diplomat posted to Islamabad who also spoke to CBS News on condition of anonymity said on Monday that the "cooling-off in Pak-Saudi relations" was driven "by a wider set of issues." The diplomat said the Saudis appeared to be "concerned over Pakistan's future as there are a number of stories of corruption making the round." Zardari has faced charges of corruption in the past when his late wife Benazir Bhutto twice served as the prime minister in the 1990s. In his defense, Zardari's supporters say, the allegations were never proven conclusively, suggesting that the charges could never be upheld completely in courts of law after they were sent for trial. "Part of the concern for the Saudi monarch is that the perception surrounding Pakistan right now is very negative. Pakistan does not seem even beginning to tackle its image of corruption in high places," said the Arab diplomat. Both diplomats also said that the rift in part may have to do with the centuries-old split between Shia and Sunni ideologies within Islam. Zardari is reputed to be a follower the Shia tradition followed in Iran, while the Sunni faith predominates in Saudi Arabia.